It has been said that we can gain insight into our adult personality by reflecting on our favorite stories from childhood — that those stories would reflect themes that would come to occupy a central place in our lives. Maybe so. A the very least, it can be fun to revisit those stories. I have two. I still have my original copy of The Story of Ferdinand complete with scribbling done by my brother when he was mad at me. It is a story about being different and coming to accept ourselves as we are and not as others think we should be. It also is a wonderful metaphor for non-violence. For me, though, Ferdinand reflected my own introversion. As all the other bulls would run and jump, Ferdinand would just sit under his favorite cork tree and smell the flowers. Many of us introverts grow up believing that our quietness and desire for solitude are aberrations. Somehow at an early age Ferdinand reassured me that it was OK to like being alone and enjoy simple things. And let me go on record and say that I can’t stand the Walt Disney cartoon version or the more recent full-length movie. 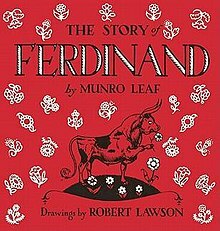 The story of Ferdinand is simple and profound as is. The second book that I read multiple times was The Story of Doctor Doolittle. This story captivated me not only because Doctor Doolittle could talk to animals but because he loved adventure. I think that this appealed to the dreamer inside of me and I think it also helped me believe in magic and wonder. The talking animals as well as the great adventures encouraged me to look beyond the situation as it is and to seek out the situation as it could be. I hope I never lose that child-like capacity to wonder and to dream. Perhaps it was no accident that the first date I had with my wife was the movie version of Doctor Doolittle with Rex Harrison. The world has gotten complicated and, for many, has lost its magic, reflected perhaps in current popular children’s books with titles like Walter the Farting Dog and Captain Underpants. For that reason I sent my newest grandson his copy of Ferdinand. Reflection: What are some favorite stories from your childhood? What themes did they foreshadow? This entry was posted in psychology, spirituality and tagged children's books, The Story of Doctor Doolittle, The Story of Ferdinand. Bookmark the permalink. It may sound silly but I always liked “The Little Engine that Could” -“I think I can, I think I can, I think I can”. Sadly, I learned that in real life, sometimes we can’t, even though we think we can. BUT, the growth that comes from trying is immeasurable.